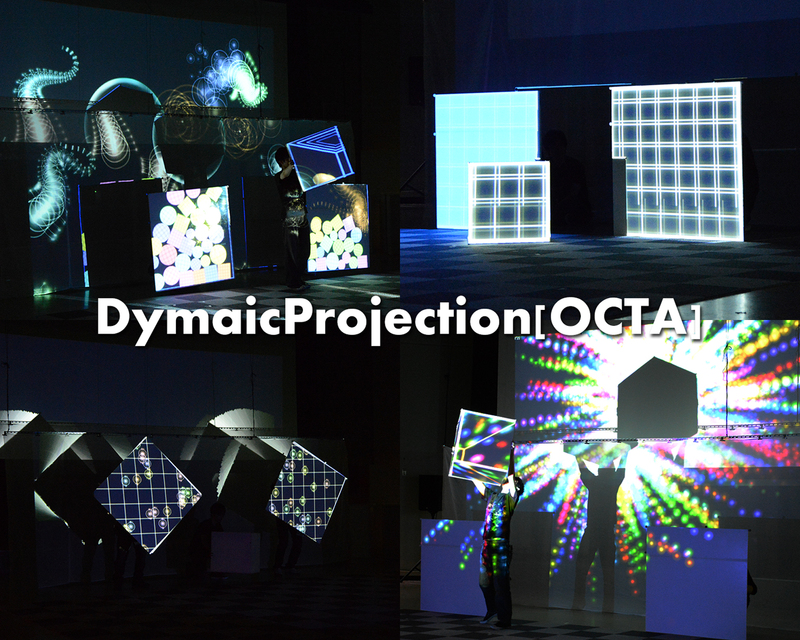 Dynamic Projection [OCTA] is a projection mapping art work “in which objects move dynamically”. High-precision tracking of projected image changes featureless cube and two panels (made of styrofoam) to the “magic objects” which is intermediate of real and virtual. Moreover, the feature of accurate motion tracking enables a performer not to move according to image but move without inhibition. The system can reflect creativity of the performer and the delightful happening in the spot. The performance is roughly divided into three scenes and reflected technological expansion until this work is produced. It all starts from here. You will notice that the particles pursue the cube which the performer moves, and trajectory of movement is displayed on the back screen. A virtual physical things inside the cube and on the panel surfaces returns a reaction according to “How the performer move objects” on site. Other scene.Dynamic projection with panels Panel representation of the second half, has produced the illusion effect by switching the particle movements between being fixed to the panel and fixed to the space. All of these image expressions are output from 1 fixed projector. ASIA2013_Kudo_Dynamic_Projection from ACM SIGGRAPH on Vimeo.